The figure convulses violently, his hair lurching this way and that. His body flutters in spasms too quick to be seen, jumping instantaneously across miniscule distances without moving through the space in between. Next to the figure, the hands of a clock spin alarmingly out of control: relentless, emotionless, like a machine lost in manic dream. And always, throughout this frenzy, a facial expression that gives nothing away, looking outward at us through the camera lens, seeming literally oblivious. Seeming literally to be facing oblivion. This is a film, being projected onto a wall in a room full of artists, curators, and academics. 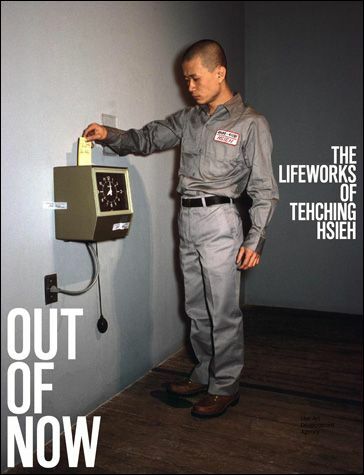 The event is the launch of the book Out of Now: The Lifeworks of Tehching Hsieh, co-authored by Hsieh and Adrian Heathfield. The film was produced over the duration of one of Hsieh's five year-long artworks, during 1980-1981, in which he pledged to punch a time clock every hour of every day for 365 days. After doing this duty each hour, Hsieh stood next to the clock, faced the camera, and exposed another frame of the film. He is always wearing the same clothes, always wearing the same expression – only his hair, shaved at the beginning of the year, seems to change. As a piece of work in itself, the film has a quality which makes it difficult to watch; but watching it with the knowledge of the full story makes it all the more unfathomable. What would it mean to know nothing for a year except the intervals between this action? To sleep, to think, to live, only in the time in between? How do you try to comprehend this while watching the six or so minutes during which this film speeds through a year of Hsieh's life? Many of us will have heard of Hsieh's one year performances, which, in addition to this year of measured time, included a year spent confined in close quarters, a year spent without shelter of any kind, a year spent tied by eight-foot rope to Linda Montano during which touch between the two was forbidden, and a year spent avoiding any contact with the objects or institutions of art. But it is one thing to know of these acts, and another to confront them: watching this film is, in one way, an encounter with the magnitude of the work. Standing before the film, I find myself face-to-face with the work. Except, of course, that I am not. Watching the film at this comfortable art opening is nothing like the work. The object of the film might have more of the residual power of Hsieh's year-long gesture than, say, whatever internal preconception I have about the work, or, for that matter, these words that you are now reading. But the gesture, though evoked more effectively, is absent. This is the nature of Hsieh's work: no one could ever have seen the work, or experienced the work, except Hsieh himself. We can only ever experience it through mediation. In the face of this inherent impossibility of commensurability between the works and their document, the book makes a mighty effort. Though its objecthood will always be insignificant with regard to the experiences Hsieh underwent, it is nonetheless a massive, magnificent object: it consists of nearly 400 pages, including over 250 pages of photographs and other visual traces, and it's a big, beautiful object – too big, in fact, to fit on the shelf with my other illustrated books. As an example of its ambition, one way the book represents the 1980-1981 work described above is by reproducing each and every film frame. Even when the frames are shrunk to half the size of a postage stamp, it still takes 30 pages, each with several hundred tiny images, to represent the year. (There are some missing frames: Hsieh overslept and missed 133 out of the 8,760 hourly appointments with the clock, and more frequently, there were malfunctions with the filmmaking apparatus.) Elsewhere in the book, Heathfield writes lovingly and carefully about each of the one year performances, substantiating them with historical contexts and philosophical ramifications. In his own reflection on the film and the experience of watching it, for example, he describes the way it produces a ‘nowhen', ‘a delirium of altered consciousness, both for Hsieh in his long durational performance and for his observers, who are left to piece together the parts.' No words, no images, no conceptual frameworks would be adequate to describe Hsieh's work, but the scale and excessiveness of this careful giant of a book are adequate, at least, to indicate the scope of their insufficiency. Hsieh's work has found itself in a peculiar place – neither here nor there – within the art market, art institutions and their circuits of exhibition, and within art and performance criticism and theory. His work and its artefacts have remained largely uncollected and only scarcely displayed. In art discourse he is rarely discussed: in the many books addressing Conceptual Art and later conceptualist work his oeuvre goes wholly unmentioned and in the major critical works focusing on Body Art, the performances are barely traced. This inattention to Hsieh's work may be because of prejudices based on nationality or ethnicity, or because of the irrelevance of institutions to the work, or perhaps as a consequence of its internal thematisation of invisibility. In any case, Out of Now is a deliberate corrective to this marginalisation, and this is at least one other function of its hefty size. Letters to Hsieh included in the book, in which Marina Abramović, Tim Etchells, Peggy Phelan, and Santiago Sierra acknowledge Hsieh's impact of their work and thought, are also part of this restoration of attention. Amongst these corrective gestures, one for which I found myself particularly grateful was the reproduction of a lengthy written interview between Heathfield and Hsieh, conducted with painstaking commitment to clarity and dependent on mediation through translation. It is evident that a lot of thought and effort went into this extended conversation, and it feels like a tremendous privilege to be able to read Hsieh's own thoughts about the origins, meanings, and problems of his work. In relation to these incomprehensible acts, what is stunning about Hsieh's words is the degree to which he seems fully to have comprehended the magnitude of what he was undertaking. His knowing, fearful, and courageous attitude toward what he did makes them all the more remarkable.